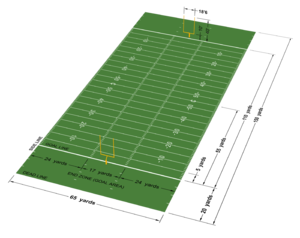 Diagram of a Canadian football field. Canadian football is a form of gridiron football played almost exclusively in Canada in which two teams of 12 players each compete for territorial control of a field of play long and wide (100 m × 60 m), attempting to advance a pointed prolate spheroid ball into the opposing team's scoring area (end zone). In Canada, the term football usually refers to Canadian football and American football collectively, or either sport specifically, depending on the context. The two sports have shared origins and are closely related, but with significant differences. Rugby football in Canada had its origins in the early 1860s, and over time, the unique game known as Canadian football developed. Both the Canadian Football League (CFL), the sport's top professional league, and Football Canada, the governing body for amateur play, trace their roots to 1884 and the founding of the Canadian Rugby Football Union. Currently active teams such as the Toronto Argonauts and Hamilton Tiger-Cats have similar longevity. The CFL is the most popular and only major professional Canadian football league. Its championship game, the Grey Cup, is the country's single largest sporting event and is watched by nearly one third of Canadian television households. Canadian football is also played at the high school, junior, collegiate, and semi-professional levels: the Canadian Junior Football League and Quebec Junior Football League are leagues for players aged 18–22, many post-secondary institutions compete in Canadian Interuniversity Sport for the Vanier Cup, and senior leagues such as the Alberta Football League have grown in popularity in recent years. Great achievements in Canadian football are enshrined in the Canadian Football Hall of Fame. Other organizations across Canada perform senior league Canadian football during the summer. The first documented gridiron football match was a game played at University College , University of Toronto on November 9, 1861. A football club was formed at the university soon afterwards, although its rules of play at this stage are unclear. In 1864, at Trinity College , Toronto, F. Barlow Cumberland and Frederick A. Bethune devised rules based on rugby football. However, modern Canadian football is widely regarded as having originated with a game of rugby played in Montreal , in 1865, when British Army officers played local civilians. The game gradually gained a following, and the Montreal Football Club was formed in 1868, the first recorded non-university football club in Canada. This rugby-football soon became popular at Montreal's McGill University . McGill challenged Harvard University to a game, in 1874. It is through this varsity play, that the game now known as American football entered the United States. Predecessors of the Canadian Football League include the Canadian Rugby Football Union (CRFU), and the Canadian Rugby Union. The CRFU, original forerunner to the current Canadian Football League, was established in 1882. As the rules of American football are very similar to Canadian football, the CFL has maintained a close relationship with its American counterpart, the National Football League (NFL). Many American players come to the CFL after failed bids to catch on in the NFL or play in the NFL after playing in the CFL (Joe Theismann, Warren Moon, Doug Flutie, Mervyn Fernandez). Image:Ottawa and Hamilton Tigers football game 5.jpg|A game between the Hamilton Tigers and an unknown Ottawa team, 1910.Image:Football game between the 4th Canadian Armoured Division Atoms and the 1st Canadian Army Red and Blue Bombers.jpg|A game between the 4th Canadian Armoured Division Atoms and 1st Canadian Army Red and Blue Bombers, in Utrecht , Netherlands , October 1945.Image:Statute touchdown cfhof.jpg|Touchdown monument outside the Canadian Football Hall of Fame in Hamilton, Ontario . Canadian football is played at several levels in Canada. The professional league in which the sport is played is the eight-team Canadian Football League (CFL), and its champion is awarded the Grey Cup, the oldest trophy in professional football. The CFL regular season begins in June, and playoffs are completed by mid-November. In cities with outdoor stadiums such as Calgary , Edmonton , Winnipeg , Montreal , Hamilton , and Regina , low temperatures and icy field conditions can seriously affect the outcome of a game. Amateur football is governed by Football Canada. At the university level, 27 teams play in four conferences under the auspices of Canadian Interuniversity Sport; the CIS champion is awarded the Vanier Cup. Junior football is played by many after high school before joining the university ranks. There are twenty junior teams in three divisions in the Canadian Junior Football League competing for the Canadian Bowl. The Quebec Junior Football League includes teams from Ontario and Quebec who battle for the Manson Cup. Semi-professional leagues have grown in popularity in recent years, with the Alberta Football League becoming especially popular. The Northern Football Conference formed in Ontario in 1954 has also surged in popularity as College players that do not continue to or get drafted to a professional team but still want to continue playing football. The Ontario champion plays against the Alberta Football league champion for the "National Championship". The Canadian Major Football League is the governing body for the semi-professional game. The Canadian football field is long and wide with end zones deep. At each goal line is a set of high goalposts, which consist of two uprights joined by a 18½-foot long crossbar which is above the goal line. The goalposts may be H-shaped (both posts fixed in the ground) although in the higher-calibre competitions the tuning-fork design (supported by a single curved post behind the goal line, so that each post starts above the ground) is preferred. The sides of the field are marked by white sidelines, the goal line is marked in white, and white lines are drawn laterally across the field every from the goal line. "Hash marks" are painted in white, perpendicular to the yardage lines, from the sidelines. Play begins with one team place-kicking the ball from its own line. Both teams then attempt to catch the ball. The player who recovers the ball may run while holding the ball, or lateral throw the ball to a teammate. Play stops when the ball carrier's knee, elbow, or any other body part aside from the feet and hands, is forced to the ground (a tackle); when a forward pass is not caught on the fly (during live play); when a touchdown (see below) or a field goal is scored; when the ball leaves the playing area by any means (being carried, thrown, or fumbled out of bounds); or when the ball carrier is in a standing position but can no longer move. If no score has been made, the next play starts from scrimmage. Before scrimmage, an official places the ball at the spot it was at the stop of clock, but no nearer than from the sideline or from the goal line. The line parallel to the goal line passing through the ball (line from sideline to sideline for the length of the ball) is referred to as the line of scrimmage. This line is a sort of "no-man's land"; players must stay on their respective sides of this line until the play has begun again. For a scrimmage to be valid the team in possession of the football must have seven players, excluding the quarterback, within one yard of the line of scrimmage. The defending team must stay a yard or more back from the line of scrimmage. run with the ball, attempting to run farther down field (gaining yardage). The ball-carrier may run in any direction he sees fit (including backwards). Each play constitutes a down. The offence must advance the ball at least ten yards towards the opponents' goal line within three downs or forfeit the ball to their opponents. Once ten yards have been gained the offence gains a new set of three downs (rather than the four downs given in American football). Downs do not accumulate. If the offensive team completes on their first play, they lose the other two downs and are granted another set of three. If a team fails to gain ten yards in two downs they usually punt the ball on third down or try to kick a field goal (see below), depending on their position on the field. If the offence scores a field goal, the scoring team must kickoff from their own line. If the offence scores a touchdown, the scoring team must kickoff from their own line. This also applies when the defence scores on a turnover which is returned for a touchdown — technically, they become the offence until the conclusion of the play, and the scoring team must still kickoff. If the defence scores on a safety (bringing the ball down in the offence's own end zone), they have the right to claim possession. There are many rules to contact in this type of football. First, the only player on the field who may be legally tackled is the player currently in possession of the football (the ball carrier). Second, a receiver, that is to say, an offensive player sent down the field to receive a pass, may not be interfered with (have his motion impeded, be blocked, etc.) unless he is within one yard of the line of scrimmage (instead of in American football). Any player may block another player's passage, so long as he does not hold or trip the player he intends to block. The kicker may not be contacted after the kick but before his kicking leg returns to the ground (this rule is not enforced upon a player who has blocked a kick), and the quarterback, having already thrown the ball, may not be hit or tackled. Infractions of the rules are punished with penalties, typically a loss of yardage of 5, 10 or against the penalized team. Minor violations such as offside (a player from either side encroaching into scrimmage zone before the play starts) are penalized five yards, more serious penalties (such as holding) are penalized , and severe violations (such as face-masking) of the rules are typically penalized . Depending on the penalty, the penalty yardage may be assessed from the original line of scrimmage, the spot the violation occurred, or the place the ball ended after the play. Penalties on the offence may, or may not, result in a loss of down; penalties on the defence may result in a first down being automatically awarded to the offence. For particularly severe conduct, the game official(s) may eject players (ejected players may be substituted for), or in exceptional cases, declare the game over and award victory to one side or the other. Penalties do not affect the yard line which the offence must reach in order to reach first down (unless the penalty results in a first down being awarded); if a penalty against the defence results in the first down yardage being attained, then the offence is awarded a first down. After a touchdown, the team that scored attempts one scrimmage play from any point between the hash marks on or outside the opponents' line. If they make what would normally be a field goal, they score one point; what would normally be a touchdown scores two points (a "two-point conversion"). No matter what happens on the convert attempt, play then continues with a kickoff (see below). Scored when the ball becomes dead in the possession of a team in its own goal area, or when the ball touches or crosses the dead-line, or side-line-in-goal and touches the ground, a player, or some object beyond these lines as a result of the team scored against making a play. It is worth two points. This is different from a single (see below) in that the team scored against begins with possession of the ball. The most common safety is on a third down punt from the end zone, in which the kicker decides not to punt and keeps the ball in his team's own goal area. The ball is then turned over to the receiving team (who gained the two points), and they begin their first down possession play from their own line on their side of the field. Officially, the single is called a rouge (French for "red") but is often referred to as a single. The exact derivation of the term is unknown but it has been thought that in early Canadian football, the scoring of a single was signalled with a red flag. Following a touchdown and convert attempt (successful or not), play resumes with the scoring team kicking off from its own line (45-yard line in amateur leagues). Following a field goal, the non-scoring team may choose for play to resume either with a kickoff as above, or by scrimmaging the ball from its own line. Following a safety, the scoring team may choose for play to resume in either of the above ways, or it may choose to kick off from its own line. Following a single or rouge, play resumes with the non-scoring team scrimmaging from its own line, unless the single is awarded on a missed field goal, in which case the non-scoring team scrimmages from either the line or the yard line from which the field goal was attempted, whichever is greater. The game consists of two 30-minute halves, each of which is divided into two 15-minute quarters. The clock counts down from 15:00 in each quarter. Timing rules change when there are three minutes remaining in a half.A short break interval occurs after the end of each quarter (a longer break at halftime), and the two teams then change goals. The University of Alberta Golden Bears (yellow and white, offence) are first-and-ten at their line against the Calgary Dinos (red and black, defence) in a CIS football game at McMahon Stadium in 2006. The twelve players of each side and the umpire (one of seven official) are shown. The Golden Bears are in a one-back offence with five receivers. Backs: Backs line up behind the linemen; they may run with the ball, receive handoffs, laterals, and forward passes. They may also be in motion before the play starts. Quarterback: Generally the leader of the offence. Calls all plays to teammates, receives the ball off of snap, and initiates the action usually by running the ball himself, passing the ball to a receiver, or handing the ball off to another back. Fullback: Multiple roles including pass protection, receiving, and blocking for the running back. On short yardage situations may also carry the ball. Running back/Tailback: As the name implies, the main runner on the team. Also an eligible receiver and blocker on pass plays. Wide receiver: Lines up on the line of scrimmage, usually at a distance from the centre. Runs down the field in order to catch a forward pass from the quarterback. Slotback: Similar to the wide receiver, but lines up closer to the offensive line. Centre: Snaps the ball to the quarterback. Most important pass blocker on pass plays. Calls offensive-line plays. Left/right guard: Stands to the left and right of the centre helps protect the quarterback, Usually very good run blockers to open holes up the middle for runners. Left/right tackle: Stands on the ends of the offensive line, The biggest men on the line, usually well over 300 pounds (140 kg). Usually very good pass blockers. Offensive lineman: Collective name for centre, guards, and tackles. The rules do not constrain how the defence may arrange itself (other than the requirement that they must remain one yard behind the line of scrimmage until the play starts). Cornerback: Covers the wide receivers on most plays. Safety: Covers deep. Last line of defence, can offer run support or blitz. Defensive halfback: Covers the slotback and helps contain the run from going to the outside. Defensive back: Collective term for cornerback, safety, and defensive halfback. Nose tackle: Lineman across from centre, tries to get past the offensive-line or take double team and open holes for blitzes. Defensive tackle: Inside defensive linemen try to break through the offensive line and open holes for linebackers. Defensive end: Main rushing lineman. Rushes the quarterback and try to contain rushers behind the line of scrimmage. Middle linebacker: Lines up across from the centre 3 to back. Quarterback of the defence. Calls plays for lineman and linebackers. Weak-side linebacker: Lines up on the short side of field, and can drop into pass coverage or contain. Strong-side linebacker: Lines up on the opposite side and usually rushes. Special teams generally refers to kicking plays, which typically involve a change in possession. Holder: Receives the snap on field goal tries and converts; places the ball in position and holds it to be kicked by the kicker. This position is generally filled by a reserve quarterback; occasionally the starting quarterback or punter will fill in as holder. Returners: Fast, agile runners who specialize in fielding punts and kickoffs, attempting to advance them for better field position or a score. Stebbins, Robert A. (1993) Canadian Football: The View from the Helmet. Toronto, ON: Canadian Scholars Press.